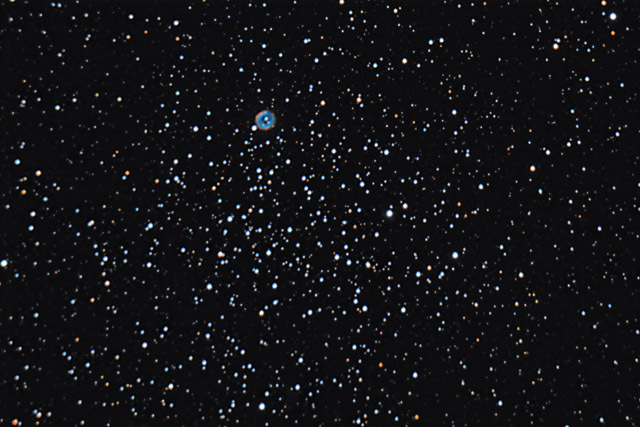 M46 is a bright open cluster in the constellation of Puppis. While the cluster is a worthy object on its own, the superposition of the bright planetary nebula NGC 2438 adds to the beauty of the field. As it happens, the planetary nebula is almost certainly not associated with the cluster since the planetary nebula stage of a star's life is a very late stage. 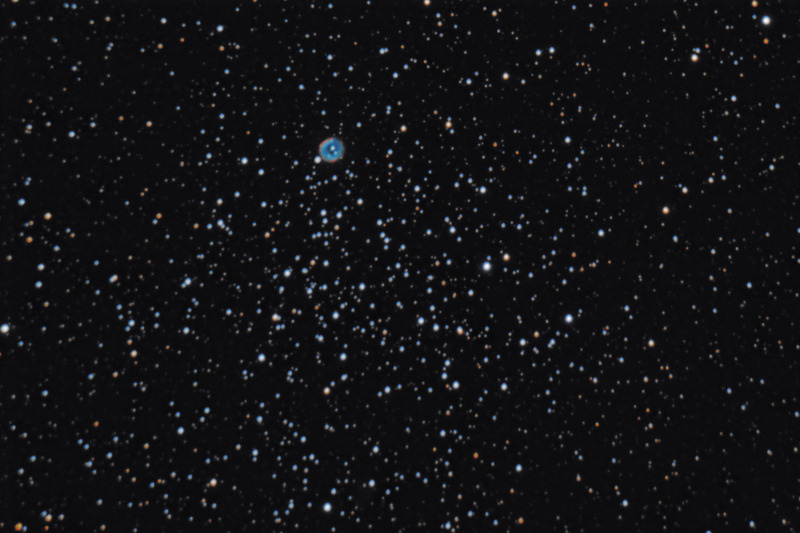 However, the stars in M46 are all very young stars, so the cluster would probably not be old enough to have a member reach its planetary stage. Moreover, the cluster and the planetary nebula have different radial velocities which implies that they are not directly associated. Software Used Images Plus 4.5 for camera control, Images Plus 4.0 for calibration, stacking, digital development, and multiresolution smoothing. Photoshop CS5 used for flat fielding, levels and curves, color balance, high pass filter, star shrinking, saturation adjustments, and noise reduction. Carboni Tools for additional saturation adjustments and noise reduction. Notes This is a nice cluster and this image is pretty good. However, the seeing the night I photographed it was quite poor, so the stars are a bit more bloated than I'd like. Oh well, I guess I can't always have the greatest conditions. This image won 2nd place in Digital Astro's Challenge Photo - Star Cluster category for January 2012.